Veterinary vaccines are used to prevent and treat animal diseases. 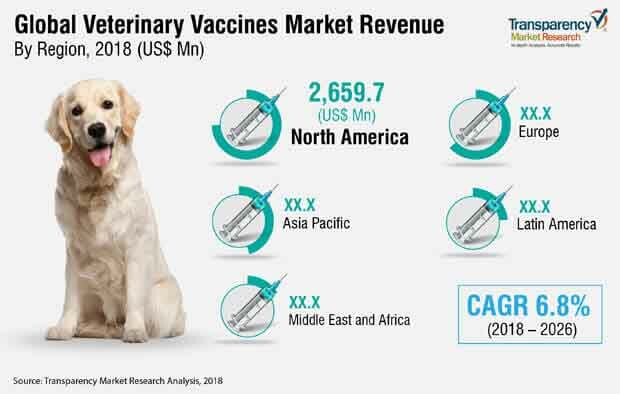 In terms of revenue, the global veterinary vaccines market was valued at almost US$ 6,100 Mn in 2017 and is anticipated to reach over US$ 12,000 Mn in 2026, expanding at a CAGR of above 6.5% from 2018 to 2026. Rise in the prevalence of animal diseases and increase in spending on companion animals across the globe are likely to drive the global veterinary vaccines market from 2018 to 2026. Globalization leads to the outbreak of many animal diseases, and some of them are transmissible to humans. According to the Food and Agriculture Organization of the United Nations, foot and mouth diseases and avian influenza outbreaks are the two major trans boundary animal diseases that lead to economic concern globally. A large number of global manufacturers are putting constant efforts to develop and manufacture novel vaccines to meet the medical needs of animals. Demand for advanced vaccines such as DNA vaccines, recombinants vaccines, etc. is on the rise. Key players are focusing on the development of new vaccines with better efficacy. For instance, Merck Animal Health launched the INNOVAX-ND-IBD, the first live vaccine made with biotechnology that protects chickens from Newcastle Disease, infectious bursal disease, and Marek’s disease. These key developments are likely to augment the global veterinary vaccines market in the near future. However, high dependence on government distribution channels and stringent regulations for vaccines approval are likely to restrain the global veterinary vaccines market during the forecast period. The global veterinary vaccines market can be segmented based on technology, animal, and region. In terms of technology, the live attenuated vaccines segment is projected to dominate the market. However, the segment is expected to lose market share during the forecast period due to fewer opportunities for new entrants in the segment. Moreover, live-attenuated vaccines fail to provide complete protection against emerging and heterologous field strains of this virus. The other vaccines segment is projected to expand at a rapid CAGR during the forecast period. Demand for other vaccines, such as DNA vaccines, is increasing due to their advantages over traditional vaccines. The advantages include no post vaccination reaction and no need for adjuvants. These factors are fueling the growth of the segment. Based on animal, the livestock animal vaccines segment led the market in terms of revenue in 2017. However, the segment is projected to lose market share during the forecast period. This is due to a decrease in the number of farm animals in some regions. In terms of region, North America held a major share of the global veterinary vaccines market in 2017. Developed vaccination programs and increase in ownership of companion animals are factors propelling the market in North America. In terms of revenue, the market in Asia Pacific is projected to expand at a rapid pace during the forecast period due to a rise in the trend for keeping companion animals. Rise in the prevalence of animal diseases such as rotavirus and rift valley fever, awareness about different vaccination programs, and usage of different vaccines to prevent diseases in countries such as Brazil and South Africa are likely to boost the market in Latin America and Middle East & Africa. Key companies operating in the global veterinary vaccines market that are profiled in the report include Boehringer Ingelheim GmbH, Merck Animal Health, Zoetis Inc., Eli Lilly and Company, Bayer AG (Bayer Animal Health), Ceva Santé Animale, Virbac, Biovac, Neogen Corporation, and ImmuCell Corporation. These players are adopting organic and inorganic growth strategies to expand their product offerings, strengthen their geographical reach, increase customer base, and gain market share. For instance, in December 2017, Merck Animal Health acquired the Uruguay-based Prondil S.A.. This acquisition helped Merck Animal Health develop more advanced vaccines for livestock animal in order to serve its customers. Vaccines are products designed to trigger immune response to fight future infection. Vaccination can prevent many pet illness and avoid costly treatments of diseases that can be prevented. The global veterinary vaccines market is expanding at a significant pace due to factors such as new technological advances in vaccines development, continuous development of drug resistance by pathogens, and emergence of new diseases. The global veterinary vaccines market report comprises an elaborate executive summary, which includes a snapshot that provides information about various segments of the market. It also provides information and data analysis of the global market with respect to the segments based on technology, animal, and region. A detailed qualitative analysis of drivers, restraints, and opportunities has been provided in the market overview section. Additionally, the section comprises a competitive matrix and company profiles to understand the competitive landscape in the market. This section of the report also provides market attractiveness analysis by geography and market share analysis by key players, thereby presenting a thorough analysis of the overall competitive scenario in the global veterinary vaccines market. In terms of technology, the global veterinary vaccines market has been segmented into inactivated vaccines, conjugate vaccines, live attenuated vaccines, toxoid vaccines, and other vaccines. In terms of animal, the global veterinary vaccines market has been classified into companion animal vaccines and livestock animal vaccines. The technology segment has been analyzed based on different types of vaccines uses to treat and prevent different animal diseases in various regions. The market size and forecast for each of these segments have been provided for the period from 2016 to 2026, along with their respective CAGRs for the forecast period from 2018 to 2026, considering 2017 as the base year. In terms of geography, the global veterinary vaccines market has been segmented into five major regions and key countries/sub-regions in the respective region: North America (the U.S. and Canada), Europe (the U.K., Germany, France, Italy, Spain, and Rest of Europe), Asia Pacific (China, Japan, India, Australia & New Zealand, and Rest of Asia Pacific), Latin America (Brazil, Mexico and Rest of Latin America), and Middle East & Africa (GCC Countries, South Africa, Israel, and Rest of Middle East & Africa). The market size and forecast for each of these regions and the mentioned countries have been provided for the period from 2016 to 2026, along with their respective CAGRs for the period from 2018 to 2026, considering 2017 as the base year. The research study also provides the competitive scenario in these regions. The report also profiles major players in the market in terms of various attributes such as company overview, financial overview, devices portfolios, business strategies, and recent developments. Major companies profiled in the global veterinary vaccines market include Boehringer Ingelheim GmbH, Merck Animal Health, Zoetis Inc., Eli Lilly and Company, Bayer AG (Bayer Animal Health), Ceva Santé Animale, Virbac, Biovac, Neogen Corporation, and ImmuCell Corporation.